Thursday 25 FREE Ethel String Quartet Performance at Union Theater code: SuzukiEthel at box office to get your tickets . Invite your friends. NO MMSD on Friday 4/26 so come on out to the concert! call Union Theater box office 608-265-2787 or stop in at the box office. There is no limit to free ticket request. This concert between the adventurous contemporary classical string quartet Ethel and Taos Pueblo flutist Robert Mirabal is the result of a six-year collaboration to pioneer new musical experiences of interweaving cultures. Sign up at group classes or with your private studio teacher. Interactive workshop focusing on real-time creation of a new musical composition with emphasis on student participation. Involving pre existing compositions from the Ethel String Quartet and beginning student graphic notation leading to a new piece coming to life as interpreted and performed by Ethel. Ethel will also conclude the workshop by performing some of their favorites from their repertoire. Feel free to invite friends to this special workshop. Repertoire is May Concert List and pieces off of the March workshop practice list . PLEASE SIGN UP AT GROUP CLASSES ON THE POSTER BOARD AND LET YOUR PRIVATE TEACHER KNOW THAT YOU ARE PARTICIPATING. Spring will soon arrive and it is time to plan for our all school end of year concert. 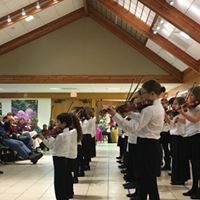 Highlighting our Ensemble, presentation of the Twinkle Class of 2019, Sonora and Prelude Strings and the entire student body of Suzuki Strings of Madison. 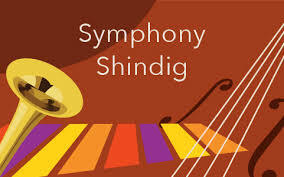 april 13 Madison Symphony at the Madison Children’s museum “Symphony Shindig” tune 2:30 and plerform 3:00-3:30 all levels welcome. We are only youth group outside of WYSO performing alongside MSO groups. The SUZUKI STRINGS OF MADISON WORKSHOP is fast approaching. PLEASE CONSULT YOUR PRIVATE TEACHER or Janse with QUESTIONS in the mean time. Special additional classes: Apollo’s Fire class, Two amazing Parent Talks and a Play In. Parent Talks and Play In occur simultaneously. Fellowship Hall is open for relaxing and eating throughout the day. MASTER CLASS times. These are semi-private lessons. dress : blue SSM T shirts and jeans All students welcome to perform. Thank you for all you do for your student and SSM . Keep up the solid review for all of these events. Bach Around the Clock at St. Andrew’s Church is Saturday, March 2. 1833 Regent Street. Free street parking on Saturday. Suzuki Strings will share the stage with students from Shannon Farley’s violin studio. Our assigned performance time is 7:20 pm. Please arrive by 7:00 pm . Go to the lower level to get tuned and lined up in the common space. Heidi and Shannon will be the attending teachers. Please wear your blue SSM tshirt and jeans. Minuet 1, Minuet 2, Minuet 3 ( books 1/3) Musette, g minor Gavotte, Two Gavottes in D and Bourree. Group class time adjustments for the semester and 2/26 schedule . Suzuki Strings of Madison is adjusting the GROUP CLASS schedule for the remainder of our semester . As MMSD has added 11 minutes to their school day due to snowdays it makes it challenging if not impossible to get to SSM classes on time. We will also add another group class in May. note: Solo recital dress rehearsal students will be rehearsing that day and will be pulled out of groups for their assigned rehearsal times. March Solo recital students will be given their rehearsal times by their private teachers. Rehearsal will be in the CPC Sanctuary. DALCROZE WILL NOT MEET TUESDAY March 5. Thank you for adjusting with us . We realize that changing our times by 15 minutes may complicate peoples schedules and apologize for this. Whether it’s cold or whether it’s hot , there will be weather , whether or not. Winter weather has been unkind to Tuesday group classes. MMSD has cancelled and our group class home Covenant Presbyterian is closed due to the snowstorm. SSM has a busy March of concerts and events. They require careful home practice . Please make sure to submit your Workshop pre-registration form to your studio teacher this week. Due to the Play in cancellation SSM is sending out the newsletter electronically. Please print your newsletter here read carefully and add dates to your home calendar. Stay Warm and Safe SSM families! The forecasted conditions are constantly changing but safety is our priority. Our families in outlying areas already have school closings and some MMSD after school events have begun to cancel. Enjoy taking time to have a relaxed home practice. Next week is our January PLAY IN. Book 4- Sonora tune 4:45 and join in. 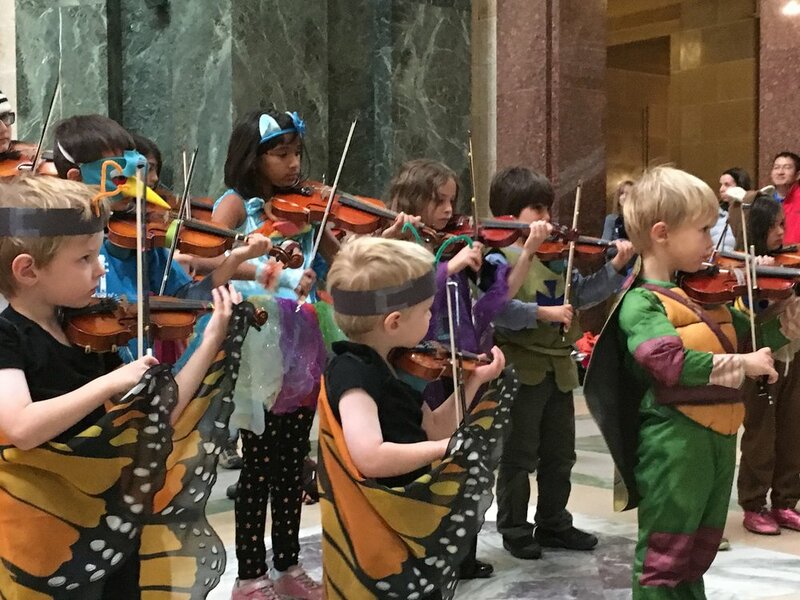 Welcome back Suzuki Strings of Madison 2019! Click above to print your copy of this months newsletter. ~Information on SSM Harlem Globetrotters rehearsal 12/18 at 4:45 and performance at the Alliant Energy Center , Saturday December 29 at 2 pm. For immediate response from our families. PERFORM STAR SPANGLED BANNER AT THE ALLIANT ENERGY CENTER COLISEUM before the Harlem Globetrotters family show . Saturday December 29 2 Pm show. We need to sell 50 tickets in order to participate. We receive discounts on all levels of tickets with the lowest price being 16$. INVITE FRIENDS AND FAMILY under the SUZUKI STRINGS rate. WE can always add more tickets if we reach 50 or remove tickets if we do not dip below 50. Commitment needed to secure this performance by Tuesday October 30 evening. Name of performer and approximately how many attending. Star Spangled Banner two versions : first position and upper octave. Suitable for students end of Book 1 through Sonora. Great Wolf Lodge concert Sunday December 9 will have a sign up for Prelude and Sonora students. Time to be secured soon and will be afternoon so that we have lots of time to swim. Repertoire will be same as Olbrich Gardens concert. Capitol Lakes Book 1-2 concert Tuesday December 11 at 4:00- pm preceding the Olbrich Gardens rehearsal. Concert is Saturday December 15 at the Capitol Lakes Retirement Center Auditorium. Parking is located across the street. Please be sure to take a ticket and have it validated at the front desk. Capitol Lakes is located at 333 West Main Street, not far from the Wisconsin State Capitol. Dress rehearsal is Tuesday December 11 at 4:45 pm in Bradfield Hall.